Last week I did a class with the Watercolor Winter card kit. This kit is a ton of fun- filled with sparkles and diecuts galor. And even sweeter, right now it is on sale on the clearance rack, so grab your kit before they dissapear! This was one of my favorite designs. For this card I watercolored the word MERRY in Cherry Cobbler with a bit of an ombre look to it. Then I added the letters to the card along with the snowflake (trimmed down) and some sparkles. To finish it off I stamped the word Christmas at the bottom. And this was my other favorite. 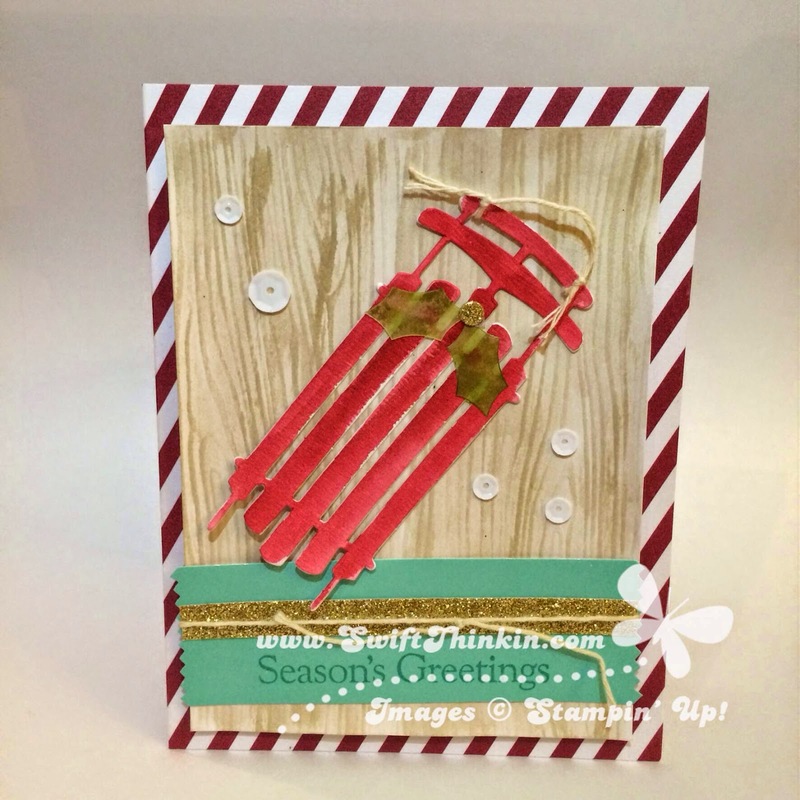 I just love the little sleigh- also watercolored in Cherry Cobbler. I wanted the woodgrain background to be brown, so I watercolored that Crumb Cake. And to get the vellum leaves green I pressed them into the Old Olive ink pad, and then wiped off the excess ink with my scrap paper (if you try to watercolor the vellum the wetness will cause it to curl- so avoid it unless you want that look). For my last card I wanted more of the sparkly gold tree to show, so I only used one set of the trees (the white one was watercolored Old Olive) and offset them from one another instead of stacking. I also added a bit of watercolored 'snow' to the sky. I liked how it gave the scene just a little something extra. Hope you enjoyed these alternatives. Flutterby again soon!